To be honest, we don't know if there's something wrong or not; it depends on what your opinion of "wrong" is. On the one hand, the sun is enduring the deepest solar minimum for a century, perplexing solar physicists, leading to some suggestions the sun may continue its blank stare for some time to come. As sunspot number is astonishingly low, this means internal magnetic activity must also be low. For some reason, the usual cycle of 11 years from peak to trough -- from solar maximum to solar minimum -- has been interrupted. The fireworks we experienced in 2003 could be a thing of the past and we might be looking at another Maunder Minimum (an extended period of time from 1645 to 1715 when few sunspots were seen by astronomers). As magnetic activity is low, this also means there has been a drop in solar energy output. 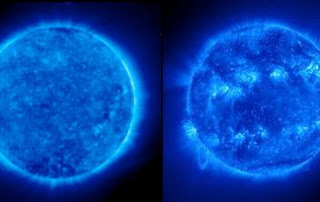 There has been a 0.02 percent decrease in optical light and a 6 percent drop in ultraviolet light if we compare this solar minimum with the last one, 12 years ago. Although we're not going to freeze any time soon, the suns reduction in output could have consequences for our climate. But no, it won't save us from carbon-induced global warming, that problem is here to stay. Although there is a possibility this solar minimum may continue, it is just as likely the sun is just being lazy, waiting to surprise us with a stealthy explosion of magnetic fury. The sun could erupt with a rash of sunspots as the internal magnetic field becomes so stressed it rises through the solar photosphere, tearing apart the uppermost layers of hot plasma, creating dark patches of sunspot swarms. If this is the case, we can expect violent knots of magnetism to funnel multi-million degree plasma from the inner sun, high into the corona (the sun's atmosphere), creating arcades of bright coronal loops. When this happens, the scene is set for the biggest explosions in our Solar System: flares and coronal mass ejections -- both of which can be very bad for planet Earth. As global society becomes more advanced, we depend more and more on communications satellites. If we end up staring down the barrel of a solar flare, we could be hit by a CME bubble, sandblasting our atmosphere with solar ions. The delicate circuits onboard critical global positioning satellites (GPS) could be rendered useless, and the upper atmosphere may expand as it is heated, increasing the drag on orbiting satellites, causing them to crash and burn. Even though sun-Earth interactions can be pretty (generating huge light shows known as aurorae at high latitudes), solar storms are generally very bad news for technology (and for humans) in space. Even on the ground we may not be safe. A vast amount of energy is dumped into our atmosphere, possibly overloading our national electrical grids. This could be very costly. Add the chaos of the loss of satellites and we could be looking at a huge mess and an even larger clean-up bill. According to a recent estimate by an NOAA scientist, the next solar storm could inflict $2 trillion-worth of damage. Also, such a huge blast from the sun could take the world 10 years to recover... just in time for the next solar maximum to smack us again! But wait a minute, why are we freaking out about being battered and bruised by the sun when it's currently acting like the perfect neighbor? It's being quiet, unassuming and shy; few sunspots, little solar activity and certainly no Earth-shattering solar flares. Why are we suddenly getting so worried? The sun, in many ways, is still a mystery. As national infrastructures are becoming more susceptible to space weather, we get concerned for our growing fleet of critical satellites and huge electrical grids. The last thing we need is a sun with an unpredictable temper. If the sun gets angry, flinging CMEs in our direction, our current economic woes will be a cakewalk in comparison. Although the sun has a periodic and predictable cycle, it still holds many surprises. For all we know it could continue to be "boring", sending solar astronomers asleep at their 'scopes for years to come. On the other hand, a rash of sunspots could appear very soon, revealing that we are in for a very rough ride. However, if I had to place a bet, I would say there are better odds of a mediocre solar maximum. I doubt we'll be cooked or frozen by the sun; we just have to wait and see, without getting all dramatic.